Jatropha Curcas Biodiesel is an alternative fuel derived from the fruits of the jatropha curcas plant. It can be used in compression ignition engines (diesel engines) without any modifications. It refers to methyl esters derived from jatropha oil through a process known as ‘transesterification’. Biodiesel has been recognized and accepted as an alternative and renewable source of energy which is environmentally friendly. Biodiesel is degradable, non toxic and can be used in pure form but is often blended with regular diesel. Jatropha curcas is a very hardy plant which exudes whitish latex when cut. It normally grows between 3 to 5 meters. It may produce several crops during the year under favorable conditions. 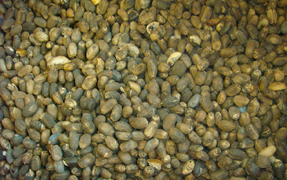 The oil content is 25-30% in the seeds and 50-60% in the kernel. The oil contains 21% saturated fatty acids and 79% unsaturated fatty acids. There are some chemical elements in the seed which are poisonous and render the oil not suitable for human consumption. 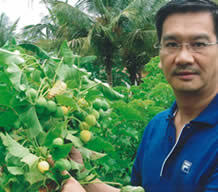 - as a medicinal plant example snake bite, clean teeth, cure piles, etc..
VDHB shall commence planting of Jatropha Curcas on the plots of Concession Land obtained from the Cambodian Government. 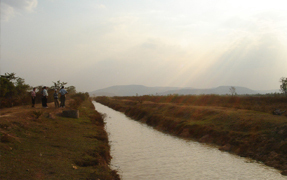 The bulk of Cambodia land is fairly flat, is vacant and without vegetation. VDHB is also in the process of planting Jatropha Curcas in Malaysia, Indonesia, Philippines, China and Laos, using one of the four Agronomy model as described in clause 18. Carry out Environment Impact Study to also determine the soil conditions, rainfall level and mapping of the land etc. Provide Civil Engineering Works including the construction of trunk roads across the Plantations. Provide Drainage System at appropriate terrain to unlock water clogging. Create Reservoirs to collect rain water and install a distribution of irrigation system. Start up Nurseries for mass propagation. Productivity created at marginal, semi-arid and waste land which otherwise would be left vacant. Create mass employment and increase earnings for the local villagers. Spin-off supporting industries, including logistics, shipping, mechanical and electrical works, road works, housing, maintenance support, etc. With the above possible contributions, VDHB has received a lot of positive and welcome gestures from high level Government Officials in the regional countries where discussions and negotiations were held. Privacy | Legal Notice | Copyright © 2007 Van der Horst Biodiesel Pte Ltd. All Rights Reserved.